IRS Tax Attorney Naperville - Owe The IRS? Let Our IRS Tax Attorneys in Naperville Help! Owe The IRS? Let Our IRS Tax Attorneys in Naperville Help! It can be daunting to owe the IRS money. You spent the entire year working, only to have to pay more in taxes than you expected. You’re not alone. The best first step for anyone filing taxes is to actually file them and file them on time. If you’re going to owe money, the worst move you can make is to ignore your tax responsibility. The penalties will stack up on top of what you already owe if you file late or don’t file at all, increasing the amount you’ll eventually have to pay the IRS. 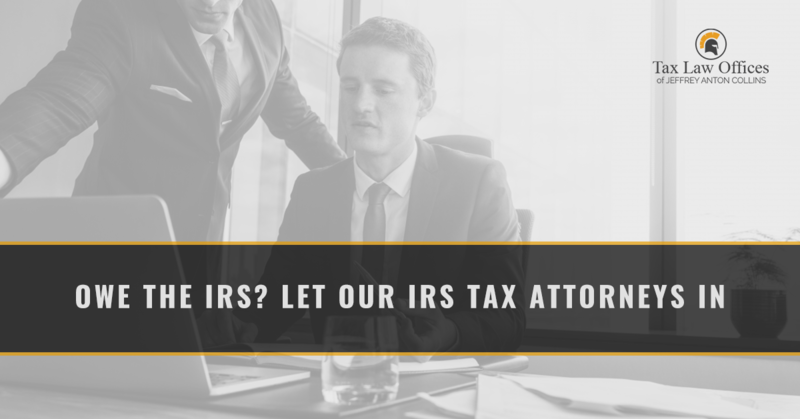 In the following post, your Naperville IRS tax attorneys at Tax Law Offices will share the four IRS payment options available to you. In a situation where you can’t pay your tax dues in full, you will have the option of a full payment agreement of up to 120 days. This means you and the IRS agree that you will pay your owed taxes in full within 120 days. You may not be able to pay the full amount of your taxes within the 120-day window, which means you’ll need to request an installation payment plan. If you qualify, you will pay your owed taxes in monthly installments over time. The IRS will not accept your full payment agreement request if you’re not current on all filing requirements. Also, those in an open bankruptcy proceeding are not eligible for this payment option. If you cannot meet any of your basic living expenses due to your owed taxes, you can request a temporarily delayed collection of owed taxes. It’s important to note that if you’re experiencing financial hardship, the taxes owed to the IRS do not go away, they are simply delayed and will be collected at a later date. Penalties and interest do accrue as long as you owe taxes, so It’s imperative you take care of your owed tax obligations as soon as possible. You don’t have to deal with the IRS alone. If you need assistance determining which payment option is best for you, give our office a call. Even if you haven’t filed yet, we can help navigate the filing process, penalties, fees, and how to get the best repayment plan for our financial situation.